This fine upstate New York resident, Michael Orchard, thought his neighbor’s house was on fire, and their dog was in danger. So he valiantly drove his 3-series through a fence, shattered a glass patio door, and “rescued” the dog. Except there was no fire. A Halfmoon man allegedly broke into his neighbor’s house to save the family dog from a fire, Thursday night. However, there was no fire. Troopers say he was on LSD and hallucinating. 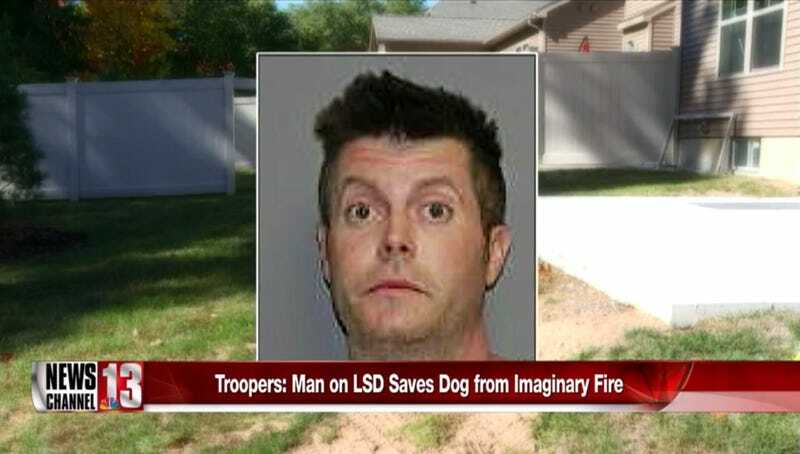 Troopers say 43-year-old Michael Orchard of Inglewood Drive told them he mixed LSD with cough medicine Thursday afternoon and they found him, standing heroically with a dog in his arms outside of what he thought was a giant inferno. “He believed that the residence was on fire and he was rescuing the dog,” said Trooper Mark Cepiel, Troop G spokesperson. Neighbors tell NewsChannel 13 that Orchard went around the neighborhood banging on doors yelling about a fire. Since no one would help, because there was no fire, the animal lover took matters into his own hands to save the dog, allegedly driving his black BMW sedan through the fence. Troopers say once Orchard got through this fence with his vehicle, he got out, went up to the back door, smashed through it and went inside to save the family’s large white dog. Orchard was charged with second-degree burglary and third-degree criminal mischief and put in county jail on $15,000 bail. Neighbors didn’t want to go on camera because they’re scared of retribution in the tightly packed development. Several neighbors listed things Orchard has allegedly destroyed in the past. We asked Cepiel why there were no drug charges if Orchard was allegedly high. “He drove over yards and through the fence. At no point was he on the roadway and no illegal substances were found in his possession,” said Cepiel.